The Tamiya 1/18 R/C 'KONGHEAD' 6x6 Off Road Truck Model Kit. 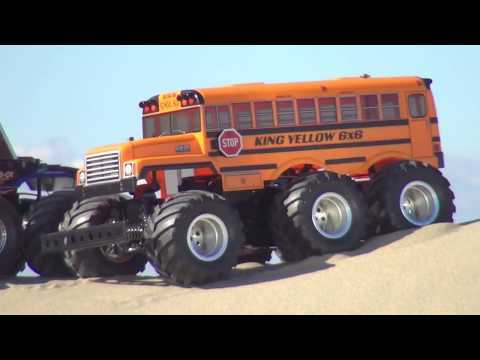 Tamiya's first ever big-wheeled 6WD model - the Konghead 6x6! This model utilizes a new geardriven 6WD chassis which used the GF-01 as a starting point. The excellent drive it provides will make for supremely fun off-road driving. The kit manual build creates a front wheel-steering model. It also includes instructions to re-assemble it into a 4WS model with steerable rear wheels. Separately-sold 4WS function transmitter and R/C equipment are required. The model is compatible with many GF-01 chassis Hop Up Option and spare parts. The Bullhead-inspired body features a brand new sticker sheet with brash, colourful logos created just for this model. Its powerful gear-driven setup allows the Konghead to take on slopes of up to 40 degrees -the perfect outdoor drive! A host of metal-plated parts includes air cleaners and exhaust (both from the Bullhead), plus chrome-plated deep rim wheels.